A group of Google workers wants the right to sue the company over workplace harassment and discrimination claims. A group of Google employees is demanding the right to sue the tech giant out in the open when it comes to all workplace discrimination and harassment claims. On Monday, the group called on Google and the tech industry to end the practice of forced arbitration, which requires employees to deal with workplace complaints behind closed doors and not in court. "Ending forced arbitration is the gateway change needed to transparently address inequity in the workplace," the Googlers for Ending Forced Arbitration wrote in their blog post. The demand is the latest employee-led activist effort to confront Google. In November, over 20,000 staffers at the tech giant participated in a company-wide walkout to protest Google's handling of workplace sexual misconduct claims. The walkout came after The New York Times reported that Google had privately given lucrative exit packages to two former company executives, despite credible claims of sexual misconduct against them. 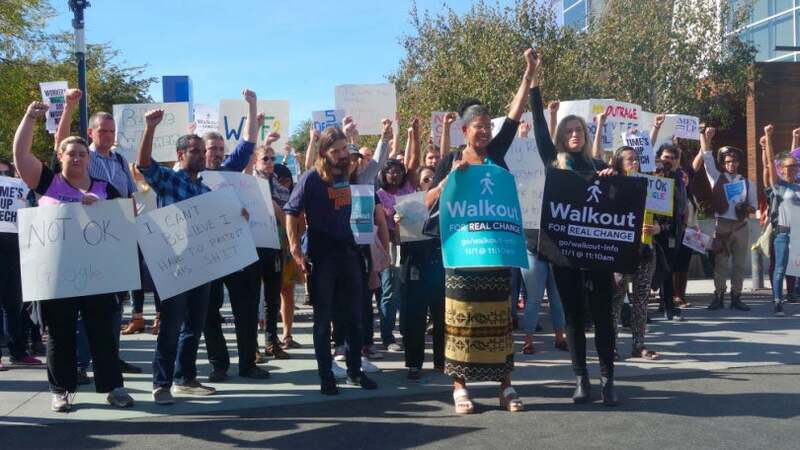 In response to the employee-led protest, the company said it would end forced arbitration, but only for individual sexual harassment and sexual assault complaints. "We recognize that we have not always gotten everything right in the past and we are sincerely sorry for that. It's clear we need to make some changes," company CEO Sundar Pichai wrote at the time. But Google's pledge may have been in name only. On Monday, the group of protesting Google employees said the tech giant is still sending out job offer letters with the company's old arbitration policy. No mention is made that the prospective hire has the option to sue Google in court over sexual harassment claims. "The change yielded a win in the headlines, but provided no meaningful gains for worker equity … nor any actual change in employee contracts or future offer letters," the group said. In addition, the company's old arbitration policy also remains in force for workplace discrimination cases related to race, religion, and sexual orientation. So far, Google hasn't responded to the claims. But on Tuesday, the protesting employees plan to launch a social media campaign that'll share interviews from tech workers who've been forced to deal with the effects of forced arbitration policies.